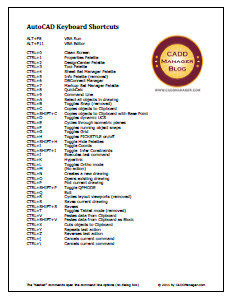 I first posted the AutoCAD Keyboard Shortcuts back in 2008 and many have downloaded and add to my list. Here is the updated list for 2012 versions of AutoCAD and the various products that use it as a platform. An added bonus – the last page lists discontinued shortcuts from prior versions. Thanks so much to Heidi Hewitt who helped me with this update. Wow this is awesome! I have new tech. coming and she has never used C3D and I had already started a command cheat sheet for her. This will definitely come in handy. Thanks very much. This is a great help since I am now using AutoCad extensively and have been out of the business for more than a decade. Wow this is awesome! Thank you very much. Thank you so much for these wonderful shortcuts, I’ve been doing research on ways to speed up my workflow, this helps out a lot. I’m printing this out asap.